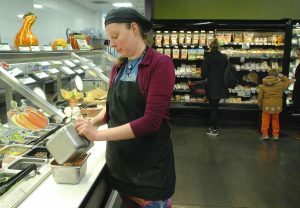 BLOOMINGTON — Green Top Grocery will remain open and should be financially stable for the next decade, thanks to recent reforms and a last-minute effort to raise at least $300,000 in a capital campaign that ended Monday, officials for the co-op said Nov. 13. The campaign started in September when officials announced a goal of $400,000, but they said a minimum of $300,000 needed to be raised by Nov. 12 to meet their bank’s expectations and prevent the store from closing. Green Top will continue to seek to raise that remaining $100,000, however, from the co-op’s owners. “At this point, all of our projections show that we will be in the black for 10 years and beyond, but we want that extra $100,000 to provide a cushion so when we start doing things next year, such as starting to pay full principle payments on our bank loan, we will not be putting ourselves in jeopardy,” said Michael Gorman, Green Top’s board president. 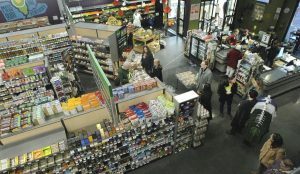 The campaign came when a turnaround plan targeting operations, prices, ownership growth and marketing launched in the spring started to pay off for the underperforming store, officials said. As of Nov. 1, sales increased 30 percent to 35 percent since the spring and ownership increased by 12 percent, Gorman said. Sales in October were up 45 percent from a year ago, making last month the store’s best month since it opened in May 2017, he added. “Our pre-opening projections may have been too idealistic,” Gorman said. “What we’re working from now is very doable. Liz Fink, deli manager at Green Top Grocery, 921 E. Washington St., prepares salad ingredients. The grocery features a variety of ready-to-eat specialties that customers can tailor to their liking. Anyone can buy an ownership stake for a one-time investment of $200, but ownership is not required to shop at the store. There currently are 1,915 owners. Owners also can lend the co-op money — typically a minimum of $1,000 — at flexible terms and earn interest of 2 to 5 percent for the life of the loan. The funding from owners was intended to secure a $1.6 million bank loan, officials said in November 2016. The latest campaign was in jeopardy right up until the final minute. On the morning of Nov. 9, the total raised stood at about $200,000, and officials were worried that the co-op store would have to close and return the loan money raised from the owners. Several of Green Top’s owners then added more last-minute loans and donations to give the campaign new life. With just four hours before the store closed for the day at 8 p.m. Nov. 12 with its future in doubt, the total raised stood at $291,038. But at 7:58 p.m., the total reached the $300,000 mark. Customers gather around a tasting event at Green Top Grocery that was sponsored by the Central Illinois Bakehouse of Champaign. The co-op store located at 921 E. Washington St. at The Foundry near the Beer Nuts plant has 23 full-time employees. Nicholas Walters, the produce manager, said he wasn’t nervous about the efforts to reach the $300,000 mark. Deli manager Liz Fink said reaching the goal was a relief for her. Gorman credited the employees and the owners for making the goal attainable. Gorman said that most owners understand the nature of the business. “That is part of the co-op business model,” he said. “They purchase ownership and they shop at the store and when we have big financial needs, they know we will come to them and ask them to support it. “We don’t see this as asking too many times and this is never going to happen again in the same way. “We opened our doors with $3.5 million in loans and a good portion of that was going to be to bridge the gap when we first opened our doors and when we reach profitability,” Gorman said. “No grocery store opens and is profitable on day one. Green Top Grocery’s fund at Illinois Prairie Community Foundation is used to purchase shares in the co-op for members of the community who cannot afford them and to provide outreach programs such as nutritional education, teaching kitchens, discount foodstuffs, a roving produce truck and other similar initiatives. To support those efforts, please make a donation online. 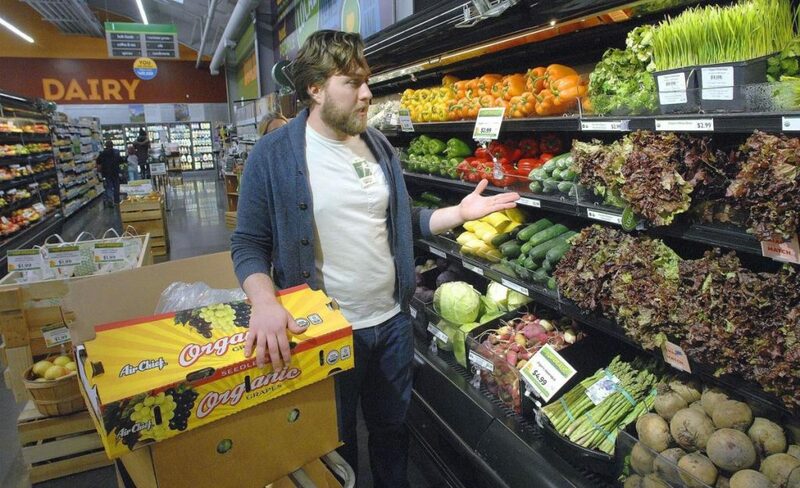 Caption for photo at top of page: Nicholas Walters, produce manager at Green Top Grocery, stocks vegetables, many of which have been grown by local farms.